The song is a remake of the 1980 film Karz. 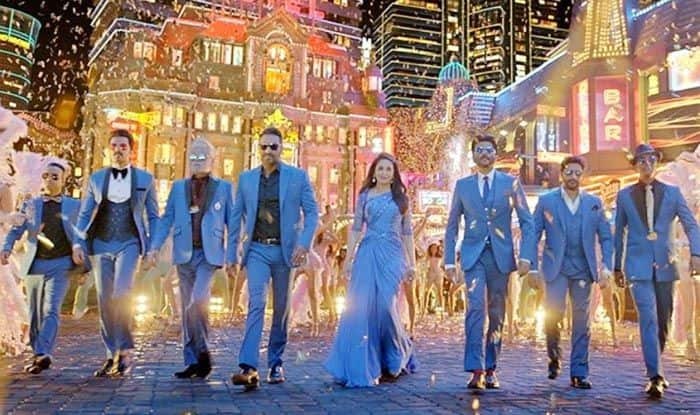 The cast for Total Dhamaal is all geared up to bring laughter to the audience, and the makers of the adventure-comedy did not disappoint when they released posters and the trailer from the movie. Now the first song, which is a remake of the 1980 film Karz starring Rishi Kapoor and Tina Munim in the lead, has also been released. Titled Paisa Yeh Paisa, the song has a groovy beat and features actors Ajay Devgn, Riteish Deshmukh, Arshad Warsi, Javed Jaffrey, Anil Kapoor, Madhuri Dixit, and others. The 1980 movie had music by Laxmikant-Pyarelal, and the current one, which is just as peppy, has lyrics by Kunwar Juneja, the singers were Dev Negi, Subhro Ganguly, and Arpita Chakraborty. The song is already proving popular and has become a big hit among the audience, with the stars all dressed in blue and dancing against a glittery golden background. Total Dhamaal, which is directed and co-produced by Indra Kumar, is the third installment in the franchise after Dhamaal (2007) and Double Dhamaal (2011). The trailer of the film had garnered a lot of interest with its hilarious scenes, and it also got many likes. The trailer, which is about the money chase and adventurous jungle safari, started with an action sequence where a car is being crushed by a moving train, followed by Anil and Madhuri falling off a waterfall and Ajay Devgn being attacked by a lion. From rhinos, snake to tigers and lions, the trailer is all about the chase, adventure and fun. The movie, which also has a host of other well-known stars, is scheduled to be released on February 22, 2019.